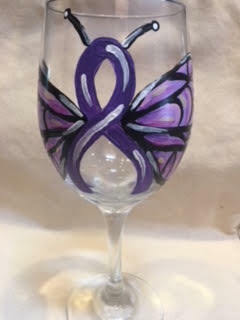 PAINTING IT FORWARD FOR LUPUS! A portion of each purchase will be donated to this great cause. Paint these pretty purple butterflies or freestyle and paint what you want. No discount, coupons, etc are allowed for this fundraiser event. DOORS OPEN AT 4:00 PM. PAINTING BEGINS AT 4:30 pm. Arrive when doors open to get settled before painting begins! Please arrive before painting is scheduled to start as our staff may not be able to catch you up. No credit will be issued if you arrive late.